Since its founding in 1998 CP-Carrillo (Irvine, CA) has established itself as a leader in developing and manufacturing pistons for high performance race vehicles and the aftermarket, as well as for vintage cars, motorcycles, and the marine and aerospace industries. Recently they acquired Carrillo Industries, a world leader in high performance connecting rods. Together, their products are found in winning racecars in virtually every format of motor sports. Senior Technology Manager and Project Developer. However, the company knows it cannot rest on its laurels - the custom and high performance markets are too competitive for that. So in recent years when customers began to request more complex parts with shorter lead times. CP-Carrillo took a critical look at its manufacturing and business processes and found that while its proprietary programming system was capable of standard machining, the complexity of the market had advanced. This was forcing them to rely too heavily on other CAM systems to perform time consuming manual operations for custom features on its high performance forged racing pistons and rods. 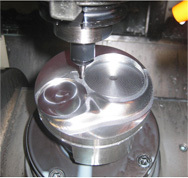 Repeat orders with small changes were being completely reprogrammed in the old CAD/CAM system leading to misinterpretation while doubling the process time. Another issue with processing orders was that, customers would come back for repeat orders sometimes after over two years; by then, all the information of the previous order were lost and the cutter path program needed to be generated again. That resulted in inconsistent quality of replaced parts. The search for a better CAM program, one capable of meeting CP-Carrillos' current needs, led the company to CAM supplier Geometric Technologies' (Scottsdale, AZ) CAMWorks® software. 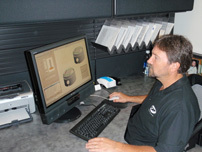 CAMWorks produces efficient machining programs directly from solid models. This seamless integration between CAMWorks and SolidWorks provides interoperability and data integration that allows manufacturers to engineer, design and build better products faster and more accurately. CAMWorks is a feature - and knowledge-based CAM system that runs within both SolidWorks and Geometric's CAMWorks Solids, an integrated solid modeler. Along with CAMWorks' ability to integrate with the SolidWorks design process, the software offered an open Application Programming Interface (API) platform that could be customized to work along with CP-Carrillo's order booking system. In addition, CAMWorks had feature recognition technology that would be able to suggest cutter paths based on different piston geometries, such as holes, bosses, pockets and perimeter cuts, and a knowledge database (TechDB) feature that would aid CP-Carrillo's in the reusing of data. These delays had a cumulative effect. “We constantly had bottlenecks in our production line waiting for programs, ” notes Ramm. This raised lead times while creating possible inconsistencies in machined finishes. Now with CAMWorks, lead times are greatly reduced by decreasing programming times down to one to two minutes for most complex and non-complex pistons alike. We no longer have bottlenecks at our machines waiting for programs, and machined finishes are consistent no matter who the programmer. Ramm and Barry Calvert, the CEO of CP-Carrillo LLC and Carrillo Industries, also wanted to develop an enterprise business process that linked the order taking system with the design and manufacturing processes. They envisioned a system that would enable the sales staff to instruct the assembly line to start the order. The CAM software needed to be integrated with their design software, with customization capabilities through (APIs) that could be linked to the ordering system. Today, CP-Carrillo LLC has a master model for designing and manufacturing pistons. They have template libraries and family tables for various types of pistons and have categorized them by manufacturing processes. When someone takes an order, it is input into the job order system (essentially an Access database). After passing checks and balances, it is then passed to the automated design/programming system via Visual Basic. SolidWorks and CAMWorks automation (using API's) creates the design, regenerates tool paths, outputs the G code to the network, and is ready at each operation site as the job travels through the shop. CP-Carrillo LLC has now doubled its productivity while ensuring consistency, thanks to a small investment in CAM software. And a repeat order, even after a few years, will be machined exactly the same way it was the first time the order was processed, using the new integrated system. To read more Customer Success stories, click here.